Recently I spent some time in the VCBC’s Safe Inhalation Space to speak with some of the patients that use this invaluable service. I wanted to get a sense of their thoughts and feelings about the space and what could happen when the new regulation come into effect in Victoria. The issue is not whether or not the dispensaries in town will be licensed; rather it is what will happen if the Safe Inhalation Space is not allowed to continue. We spoke about patient’s hopes and fears surrounding this issue. I have been a member of The VCBC since 2001. Admittedly I had never set foot in the space before this consultation with the other members – It had nothing to do with a fear of the space or not wanting to be there; rather it has never been a service that I needed to access. I have always recognized the need for this space as an essential service for many members. I do not find it to be offensive nor have I ever heard of any other member who feels this way. Upon speaking with the some of the staff I was able to verify that generally there are no complaints or concerns coming from other members regarding this space or the use of it. I have been fortunate in that I have not been in the same situation as many who use the room on a regular basis. The members that I spoke with cited many different reasons why they require access to a safe inhalation space. Many cannot safely consume their medicine at home due to housing concerns, such as fear of eviction for using their prescribed medicine, or fear of persecution from neighbors; some members have conditions which require medicating frequently for the alleviation of their symptoms; while others need to medicate when they are out and about because the journey to and from the city is too long to wait until returning home; some members say that having the ability to stop, take a break, medicate and then continue on with their day has made an appreciable difference in their lives – having somewhere to go and use their medicine safely during the day greatly helps with relieving symptoms, avoiding anxiety, and just being able to stop a take a breather, so to speak; for many members with inflammatory conditions and other conditions such as those who have mobility issues medicating outside is not a viable option; and last but certainly not least is that there is simply nowhere else to go. Members reported that being able to enjoy the safety that comes along with consuming their medicine with some degree of anonymity is of the utmost importance to them. Consuming their medicine in public is not safe and it also criminalizes and marginalizes them. Imagine that you have a medical condition which limits you from ‘normal’ daily activities and that you have found something, which, under the supervision of your doctor, works for you on all fronts and does not cause unwanted side effects. You may think to yourself ‘THIS IS GREAT!’ Now imagine that at every turn you are told that you may not use your medicine because it is offensive to other people in society. You already feel marginalized due to whatever chronic or critical illness that you face. Your body will no longer do the things that you want it to, you find it difficult to even get out of the house many days; you have lost your job, your friends, your home, and many of the things that in the past have helped to keep you on an even keel. (This is certainly not the case for all of the members of the VCBC – members come from all walks of life because illness and disease do not discriminate.) There is a reason that each of us is a member of the VCBC and this reason is our health. We have finally found something that works and gives us hope. Hope that we will be able to regain our once healthy bodies and/or minds. Cannabis is an amazing medicine. It works on a multi-faceted level. It does not just treat one symptom, but has the capability of treating concurrent symptoms and conditions. Having the ability to relieve chronic symptoms has a profound effect on our mental health. There are days, months, and years that go by where many of us cannot function, as we need to. This leads to anxiety and depression. Quite often these conditions are secondary to whatever our specific condition is – when we find ourselves not only struggling with our physical health but also our mental health life becomes incredibly difficult. As I sat in the safe inhalation space and spoke with some of the members I was overwhelmed with a sense of acceptance and a very welcoming feeling. I was treated with respect and those that I spoke with were genuinely interested in talking about the benefits that they have had in their own lives as a direct result of access to the safe inhalation space. The words that kept coming up over and over were ‘safety’ and ‘community’. During the hour and a half that I was there approximately 35 members filtered in and out of the room; some sat and talked with friends for 10 – 20 minutes while others came in and said ‘hello’, medicated and then proceeded along with their day. The room never became filled with smoke and I didn’t find that it bothered me in the least bit (I do not generally smoke or inhale cannabis but ingest it on a regular basis). I would have known it if it started to bother my lungs or respiratory system in any way. The room is pleasant and well ventilated. It does smell of cannabis – however it strikes me that it is quite similar to sitting in a coffee shop, it will smell of coffee; if I am in a bar it smells of alcohol; if I am in a bakery it smells of baking bread. You may think to yourself “but none of these produce noxious fumes” and to that I say that there is no evidence that would suggest that cannabis produces noxious fumes either. The VCBC has continually strived to make the safe inhalation room exactly what it says in the name ‘safe’. They have worked tirelessly through the years to figure out innovative ways of ventilating the room with the means that they have access to. They have done a very good job. There is hope that in the future there will be grant money available to make further improvements to the room but as a non-profit society there is only so much that can be done at any given time. 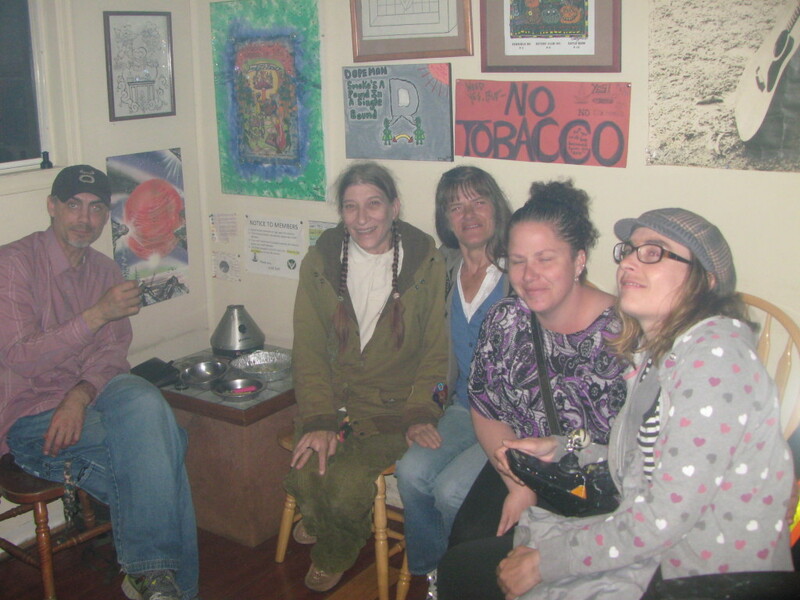 One feature of the safe inhalation space is that members have access to use of a top of the line vaporizer – The Volcano. This is the most effective delivery method for inhalation. It retails at approximately $600. This is not something that a lot of us can afford. One of the members that I spoke with comes to the space for the express purpose of using the Volcano because he cannot afford to buy his own. The VCBC is and always has been about giving patients the best possible access to medicine education, and services. With an active membership of roughly 3500 patients the estimate is that about 25% of members make use of the safe inhalation space. 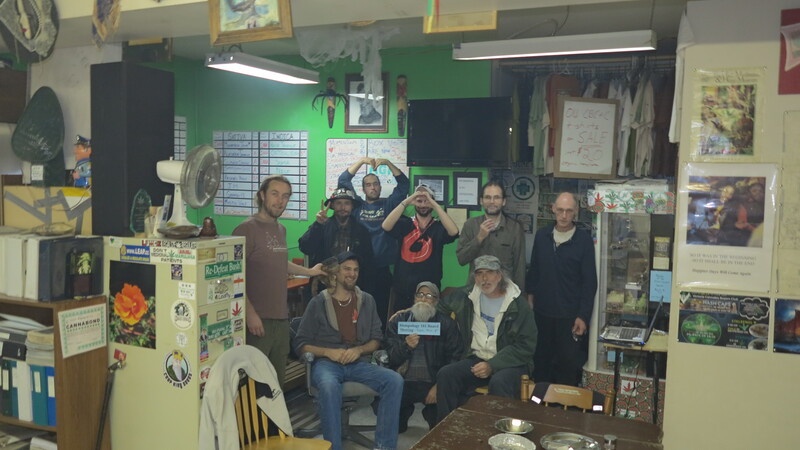 Roughly 50 – 60 members use the space per day and about 300 – 400 per week. That is a significant number of people. If this space is no longer available then where are they to go to use their medicine? I put this question to many of the members I spoke with and the answers I got are unsettling to say the least – they asserted that they would either smoke at city hall, in parks, or walking down the street. Some said that they wouldn’t be able to medicate at all. In the eyes of the law where does this put our critically and chronically ill citizens who use this medicine? Not in a very good place. As I stated earlier this is a population who is already marginalized and stigmatized for their disabilities – if their only option is to smoke their medicine in the streets it will not only serve to stigmatize and marginalize them further but it will also criminalize this population. Why not keep it in an environment that is controlled and staffed; has a set of standards, rules, and guidelines to follow; and provides a safe and supportive community of their peers? The community aspect of this space cannot be overlooked. This is somewhere that patients can come to be amongst their peers. There is absolutely nothing that can rival this space and service in the City of Victoria. Over the years lasting friendships have been made, support systems have been put into place, and a strong community has formed around this space. This isn’t like anything one can find elsewhere – there is no ‘support group’ that meets the needs of chronically/critically ill patients who use cannabis as their primary source of medicine. There is no alternative if this room is no longer available. Some of the supports that members told me they have found inside these four walls are things as simple as an ear to listen to them; people that can empathize with each other; help with finding doctor; ideas about other programs in the city that could benefit them; help with housing; help with accessing other community resources; somewhere to be and to feel accepted for who they are and what they deal with; companionship; and as I mentioned before friendship. These are not insignificant things for people who struggle each and every day with health problems. Some people said that it has helped with their social anxiety and depression in that it gets them up and out of the house, gives them something to look forward to and allows them to feel comfortable talking to others about their own situation. Others don’t talk much at all but just enjoy the companionship. Members spoke of being able to return to work and/or school after years of not working because they were able to overcome obstacles through the support they have received from their peers. They seem happy and excited about life and the opportunities that this space has allowed them. 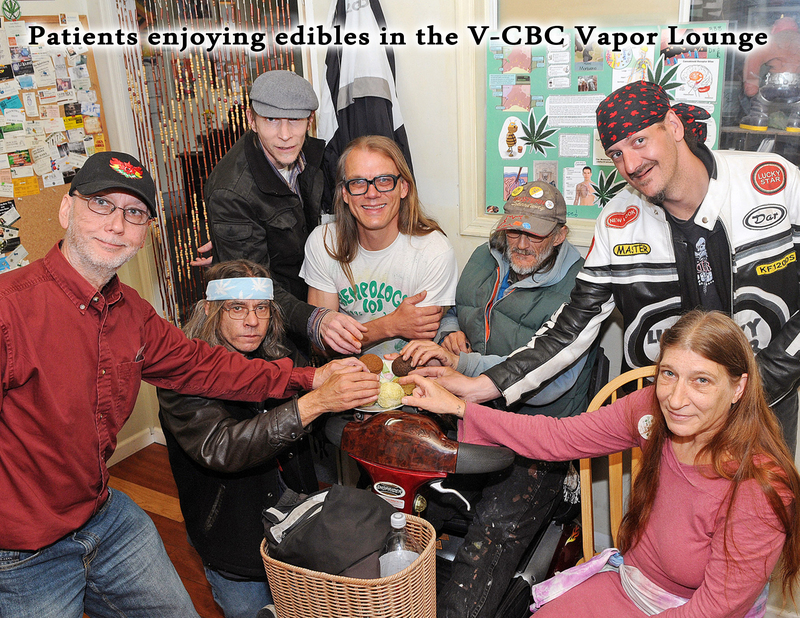 Some have even started to volunteer with the VCBC and The International Hempology 101 Society as a result of forming connections through the safe inhalation space. For those who deal with chronic illness it is no small feat to be able to return to work, or school, or to volunteer. It brings meaning and purpose to our lives. One woman that I spoke with has returned to school and she stopped in on her way home after writing an exam to medicate, relieve her pain and chat with her friends; another woman has gone back to bookkeeping after not being able to work for many years. A few men I spoke with have become very involved with The International Hempology 101 Society at The University of Victoria educating people about the benefits of the use of cannabis/hemp for industrial purposes, as a food source and as a medicine. I heard the words family, friends, healing, happiness, strength and community echoed over and over. One man told me that his take on it is that it “creates happy, healthy, and productive people.” I heard someone say, “It makes me feel valued.” It is incredibly important to maintain this community in one-way or another. If this room is lost the community will go with it. That is the sad reality. Most of these people have nowhere else to go to receive this type of support while being able to use their medicine. Many spoke about how being part of this community had improved their mental health – they have been able to come out of depression and overcome debilitating anxiety and agoraphobia because of the support they receive here. This isn’t just about a place to use medicine – this is the medicine. It is the medicine of connection and creating healthy relationships with others. We are social creatures and we need to surround ourselves with positivity and love whenever we can. It is really not viable to have this forum anywhere else. It won’t happen in someone’s living room, not in a park, not in a coffee shop, not in any support group – it can only happen here. It is a unique type of support that just doesn’t exist elsewhere. This is something that has been cultivated and nurtured for years. The staff has put a lot of effort and energy into maintaining the space and ensuring that those that use it feel safe and comfortable. Now that I have spent some time in this space I will absolutely take advantage of it again to connect with like-minded people. One point that was raised is that the people who use this space obviously deal with medical conditions – so what happens if a medical emergency occurs? I was given a very good answer to that – there is always someone on hand to help the person and to call the paramedics if need be. A specific instance of this was a man who experienced a grand mal seizure while at the VCBC. He was lucky that he was there. He didn’t even know what was happening until he woke up to members of the staff looking after him. You will definitely not find that level of care in a city park or walking down the street. If I could only use one word to sum up my take on the safe inhalation room it is ‘hope’. Hope for health; hope for a better quality of life; hope for a better future; hope for a better community. Let’s all hope that the City of Victoria listens up and deems a safe inhalation space an integral part of any dispensary. Let’s just keep hoping. Great article, confused why you intentionally mis-punctuated the headline though. Online Programs For Cannabis Dispensers: Are You Ready For The Future?